Any locus having two or more alleles (variant forms of particular genes), each with a frequency of at least 1 percent in the general population, is considered to be polymorphic. The difference between two alleles may be as subtle as a single base-pair change, such as the thymine-to-alanine substitution that alters the B chain of hemoglobin A from its wild type to its hemoglobin sickle cell state. These single nucleotide polymorphisms are termed "SNPs" ("snips"). As of March 2002, in the approximately 3.2 billion base pairs of DNA, approximately 3.2 million SNPs have been identified. Some base-pair changes have no deleterious effect on the function of the gene; nevertheless, these functionally neutral changes in the DNA still represent different alleles. Alternatively, allelic differences can be as extensive as large, multi-codon deletions, such as those observed in Duchenne muscular dystrophy. 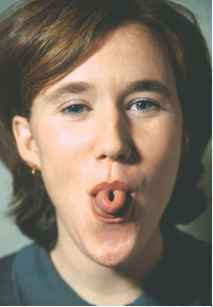 This woman has the inherited trait that allows her to roll her tongue. Genetic variations cause differences in appearances such as dimples, widow's peaks, and even hairy ears. 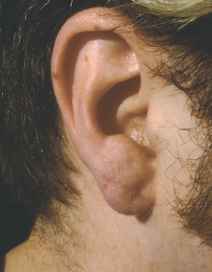 Ear wax consistency is due to single gene with two alleles (wet vs. dry), located near the chromosome 16 centromere. Genetic variation is transmissible from parent to child through germ cells, and it can occur anew via mutation in either germ cells or in somatic cells. Interestingly, new mutations occur twice as frequently in sperm as in eggs, probably because so many more cell divisions are required to make sperm than eggs.